I made the Models using 3DMax. However, the High Polygon Twinsen, is a Gigantic Edit of the Original Twinsen Model from LBA1. I'm guessing you can tell which Models are new. Here is a Picture of those new models. 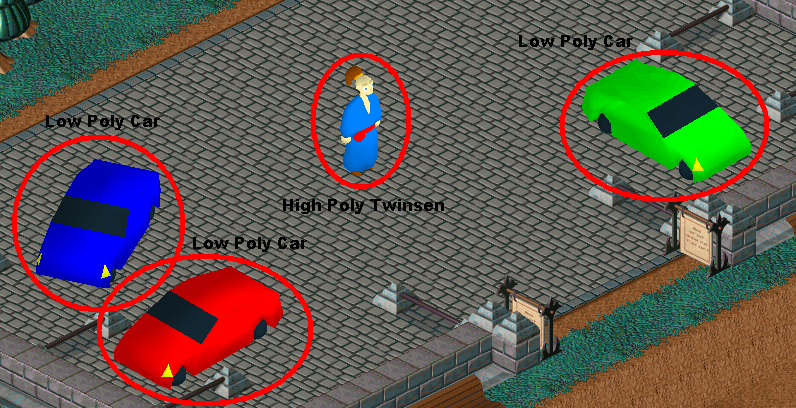 The Cars are Low Polygon and Twinsen is High Polygon. I think that sometime Alexfont should try this out, it would be pretty cool! I think he should try it by adding a feature into LBAnimator Studio. What do you Quetches think? Would this be a cool idea? I think it's a good idea. Interesting, Alexfont can surely tell correctly if it's possible. Would be a nice feature and a cool area to explore for mods. Yeah, it would be cool for modifications as well! Maybe he should try it sometime and see if it is possible. If you are a friend of his, can you try asking him? Better PM him yourself, I'm not that active sadly. Sorry. That's fine, I'll just try that sometime then.